With a set of three separate 2-1/2-quart buffet warming trays, the Oster Buffet Server lets you serve up to three warm dishes. 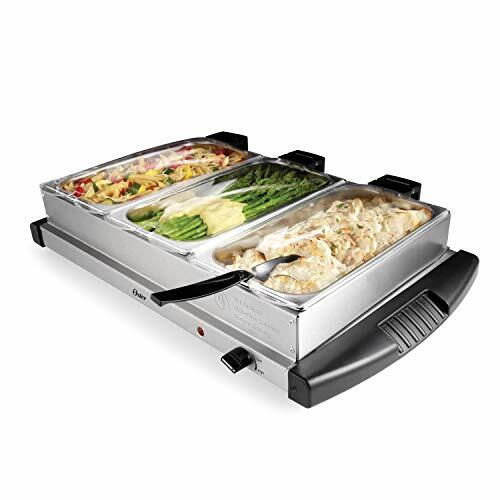 Great for holidays and parties, this buffet server features a large 20- by 13-inch heating surface that's ideal for heating up appetizers, dips, meat and vegetable dishes, desserts, and more. A temperature-control knob allows you to easily set the perfect warming temperature, while an easy-to-see power indicator light illuminates when the heating element is on. This food warmer tray features stay-cool side handles to facilitate safe, easy carrying from kitchen to table. The three included dome-shaped lids entrap heat and moisture, helping keep your dishes at the desired temperature. Both the pans and lids are dishwasher safe for easy cleanup.